This method usually requires background correction of the image, which can be done using the Process/Subtract Background command. 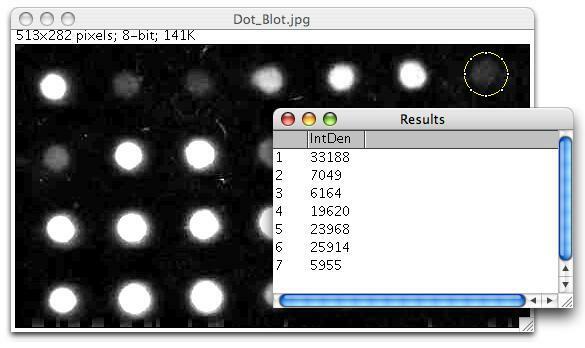 See image for profile plots (Analyze/Plot Profile) of the first row of dots before and after background correction was done using the Subtract Background command with the rolling ball radius set to 25 pixels. After correcting the background, enable "Integrated Density" in Analyze/Set Measurements, create a circular selection, drag it over the first dot, press "m" (Analyze/Measure), then repeat for the other 27 dots. Notice how the image now has a black background? It was inverted (Edit/Invert) so background pixel values are near zero, which is required for correct calculation of integrated density. You can invert the lookup table (Image/Lookup Tables/Invert LUT) to restore the original appearance of the image. The "Use Inverting Lookup Table" option in Edit/Options/Image will invert the pixel data and invert the lookup table.